As an American, you have no doubt heard about the tax reform plan being debated in the United States Senate. 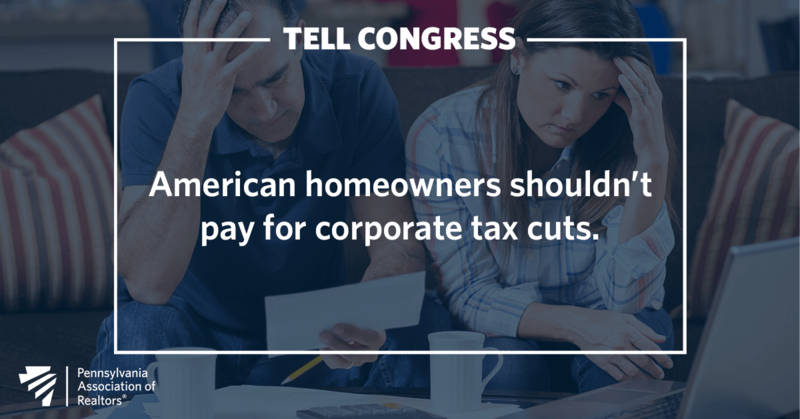 The Tax Cut and Jobs Act threatens homeowners with a loss of tax incentives and a reduction in home values. Eliminating the state and local property tax deduction and changes to the capital gains exemption will increase taxes now and when a home is sold. These incentives are critical for a strong housing market that creates jobs and builds stable communities. As your constituent, I urge you to oppose the Tax Cuts and Jobs Act, tax reform legislation being considered in the United States Senate. This bill is a direct threat to consumers and homeowners. Not only will millions of homeowners not benefit from the proposal, many will get a tax increase. Additionally, homeowners could lose substantial equity from the more than 10% drop in home values likely to result if the bill is enacted. The legislation includes changes to the exemption on capital gains tax from the sale of a primary residence, elimination of the deduction for all state and local taxes, and elimination of the deduction for interest on home equity loans. In addition, the bill restricts the deduction for moving expenses to only active duty military, and also restricts the deduction for personal casualty losses to just Presidentially declared disasters. All this from a bill that is supposed to improve the current tax system. Not only is this legislation a clear and present danger to American homeownership, it will cost our children and grandchildren $1.5 trillion in new federal debt. Please reject this bill AND protect middle class homeowners. Do not turn America from a home-owning nation to a home-renting nation. Title*Mr. Ms. Mrs. Miss Dr.